As summer begins, most everyone looks forward to spending time in a swimming pool. What better way to stay cool on a hot day? However, before there can be any cannon balls or games of Marco Polo, the pool must be prepared so that it’s clean and safe for everyone to enjoy. The following is a list of the top tips for swimming pool maintenance. Given that this will be the first time the pool has been used, there may be debris like leaves, branches, and dirt in the water. The skimmer basket is the part of the pool that collects debris for ease of disposal, and it takes just a few minutes to clean. In addition to cleaning the skimmer basket, using a net to skim the surface of the water is also necessary to catch anything else that may be floating in the water. In this step, the nozzles of the return jets should be turned downwards so that there is a clear view of the bottom. Once done, connect the vacuum to the hose and set up the pole with the head of the vacuum hanging over the water. Use a jet nozzle to rapidly fill the open hose end to cycle the water out of the vacuum. When it’s full, dip the head of the vacuum in the water and place a hand on the hose until it’s connected to the skimmer. Once the vacuum apparatus is set up, slowly make your way through the pool water in even, parallel lines. This will ensure that this important step in your swimming pool maintenance is thoroughly completed. After vacuuming the water, remove any algae or residue from the sides of the pool with a nylon or stainless steel brush. This step of swimming pool maintenance requires measurement of the chemicals that will be added to the water for continued cleanliness. Before adding any of the chemicals from your pool cleaning kit, test the pool water for chemicals. Once complete, adjust the pH of the water first, either using muriatic acid with a pH level above 7.6 or with soda ash if less than 7.4. As for the chlorine, if it measures under 1 part per million or the alkaline level is below 90 parts per million, you will need to do what’s known as “shocking the water”. This means that you will have to mix pool shock chemicals in a separate 5-gallon bucket of pool water and pour it back into the pool near a jet. Read this article for step by step instructions on shocking a pool. It can be dangerous to swim right after adding chemicals to your pool. Set the filter to the backwash setting so that the flow of water is redirected and any additional dirt is removed. Next, clean the pump filter by removing the hair and lint catcher. After turning the system off, refer to the front of the pump to close the skimmer valve which will keep the water still so that it will not need the water to be re-discharged when it restarts. Last, remove the cover of the trap and empty the contents of the basket into the garbage. The final step is to add chlorine based on your pool, which can be by chlorinator, using dissolving sticks, or a floating container. Directions will be included on the package. Be sure to refill the pool if the water level is well below the skimmer well mouth. Wait until your chlorine levels have settled to 5 ppm before you take a swim. Once you’ve completed this swimming pool maintenance, enjoy the rest of your summer while staying cool! AAA Home Inspections provides swimming pool inspections and other property inspection services to Northern New Jersey. 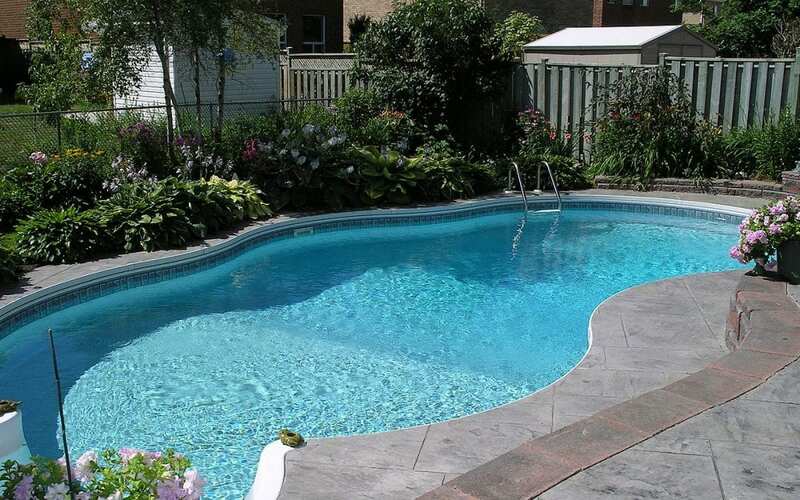 Contact us to book a pool inspection or any of our other services.